The Graduate Studies bulletin is the official document of record concerning graduate academic programs and regulations. A graduate student may expect to be allowed to obtain a degree in accordance with requirements in force at the time he or she enters the degree program at the University, or under subsequent regulations published while enrolled in that degree program. However, a student’s choice is restricted to the requirements of one bulletin. Graduate students in master’s programs have a period of six years inclusive and continuous in which to claim the rights of a specific bulletin. Doctoral students have a period of eight years. Final authority for all aspects of content rests with the Office of the Provost. All material submitted for publication in the undergraduate bulletin must be cleared through the academic editor, Helen Doerpinghaus, associate provost and dean of undergraduate affairs. For the graduate bulletin, clearance must be obtained through Cheryl Addy, Dean of the Graduate School. 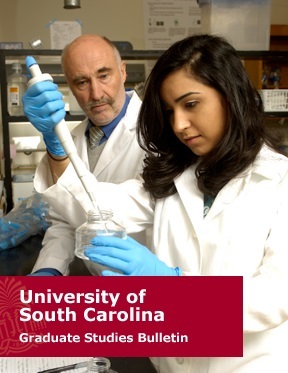 Academic bulletins for all USC campuses are available at: http://www.sc.edu/bulletin/.